We’ve delved into planning the preschool year and breaking things down into monthly lesson plans. Now it’s time to jump into the nitty-gritty of weekly plans. 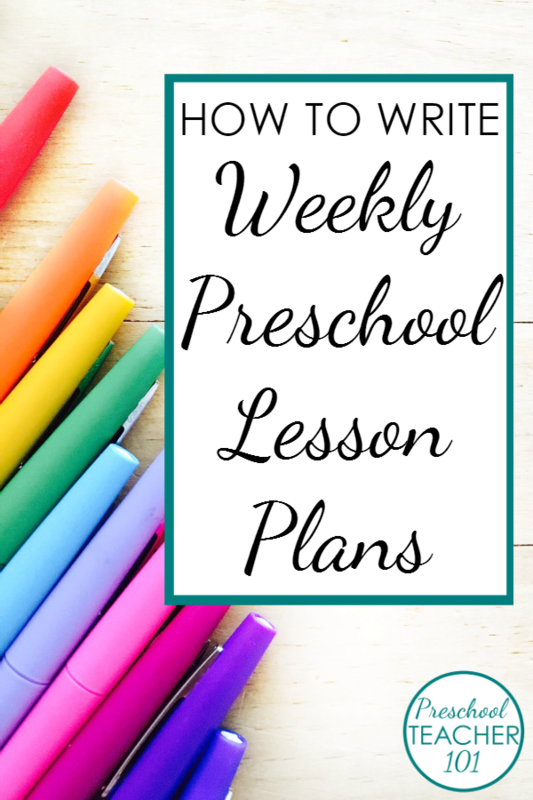 We have a free preschool lesson plan template you can try, along with step-by-step instructions for making weekly plans. Having a basic template for weekly planning can really help make the whole process easier. It enables you to record all the important aspects of the preschool week on one piece of paper. This way, there aren’t any nagging questions like, “Am I forgetting something this week?” While you may not get to every little aspect during the week, at least the days are mapped out. This is always helpful to us, as feeling prepared helps a lot with a teacher’s mindset! Yes, this is a super basic first step! Isn’t it nice when things start out simply? 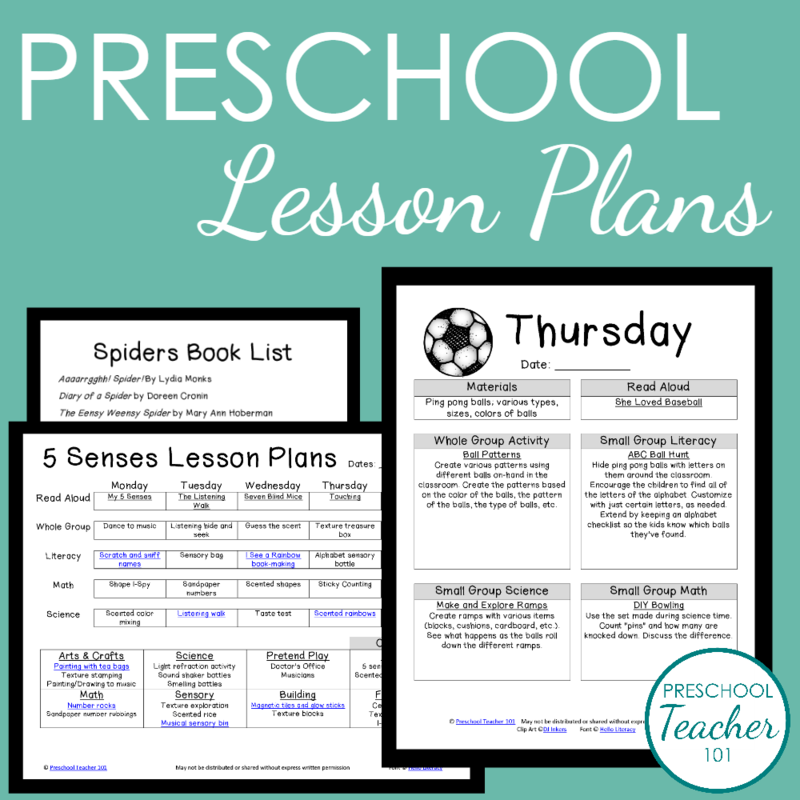 We’ve put together a preschool lesson plan template for a variety of schedules. If your preschool students are there five days a week, grab that template. If you teach two days a week, there’s one for you too. I know there are even some teachers who teach three days with one age group and two days in another (in that case, I’d suggest using a 3-day template and a 2-day template). Hopefully, we’ve covered all the bases! Pull up the template that suits you best and set the foundation for your planning. Add the theme up at the top of the page, and then be sure to enter your dates. Since the lesson plan template is editable, you can add this directly on the computer. You can change the dates to your preferred format, specify a theme, add notes and reminders, include different types of centers, and add specific lesson ideas. Those monthly plans you worked so hard on are going to come in handy. Either print them out or have them open on your computer. We often find it helpful to have the monthly notes printed out next to use as we draft the weekly plans on the computer. Which lessons can naturally be grouped together? For example, if you’re planning an apple theme – have the children taste test apples one day and then graph their favorites the next. Or have those activities grouped together on the same day. Which ideas have similar materials? If there are a few ideas that require the same materials, it’ll be easier for you to prep them all during the same week. How long will these tasks take? This will help you decide how long you allocate for the various lesson ideas. Make a few notations on your monthly plans if needed as you answer the above questions. Now you’re ready to block out a week’s worth of activities at a time! We like to do each week in the month at the same time, if possible. That way, the plans are ready a month in advance and we can focus on the daily ins and outs of teaching. If that’s not your preference, that’s okay! Then you can plan each week at your convenience. Add in the book titles that you plan on reading aloud every day to the preschool lesson plan template. If you’re anything like us, you’ll be reading more than one book each day to the preschool kids. Having one title written down for special circle time reading is always helpful, though. Then move on to whole group activities, and add in some of the ideas from your monthly outline. Be sure to consider your age group when determining what goes here. Don’t plan for giant chunks of time, as that just isn’t reasonable when it comes to preschoolers. Whole group activities could consist of literacy, science, math, music, or movement activities. You could also schedule in class meetings during this time every so often. As the year progresses, how you use this time is likely to change, and that’s perfectly okay. Once you have the week’s whole group lessons planned, proceed to the small group activities. You might lead small group activities while the children engage in independent centers. Or perhaps you have a dedicated small group time when you and your teaching assistant work with the children. While the preschool lesson plan template has five spaces each for literacy, math, and science, please note that you don’t need to fill up all of them. If you’re the only teacher in the classroom, you will want to have just one of those filled in each day. Maybe one day your focus will be literacy, while the next will have a math focus. Some teachers might not work with planned small groups at all, choosing instead to meet with the children at their center activities. This is perfectly fine, too. If that’s the case, perhaps you want to use this area of the template for recording a focus each day for literacy, math, and science. Our goal was just to ensure ample planning room for a wide variety of preschool teachers. They’re your lesson plans – use them as you see fit. Center activities are meant to be independent for the majority of your preschool classroom. This is the time when the children explore concepts you’ve already introduced. They can interact with their peers and work on those incredibly important social skills. Be sure to consider how long you want each center activity available for the children. Will your home center be a spaceship for one week, or maybe two? Do you think the discovery bottles in the science center will engage the children for more than one week? Oftentimes, young children like to attend to the same activities over and over. This helps them practice important skills, and they often learn a new aspect of the task each time. We tend to plan for two or three activities in most of the centers, just in case. This way, if we need to swap out an idea mid-week we already have something in mind. As always, you need to plan for what works best in your classroom. Repeat steps 1 through 6 for each week in the month you’re planning for. Once you have a month’s worth of lesson plans, be sure to add everything to your teaching binder or lesson plan book. We like to give each month its own space in our planning books, with the monthly outline in front and each weekly plan following it. All that’s left now is your day-to-day preschool prep! 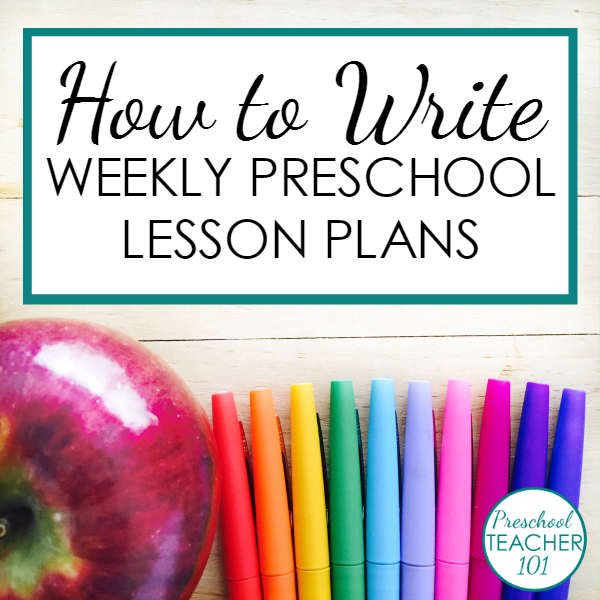 Our preschool lesson plan template is meant to be a blank canvas for all of your amazing weekly plans. Print it out and hand write your plans, or type everything on the computer before you print it out. Either way, we’re sure you’ll be doing amazing things with your preschool students. And if you’d rather spend your free time doing something other than lesson planning, check out our printable weekly lessons plans. They are available in individual sets, or you can access all of them and all of our printable resources by becoming a Preschool Teacher 101 member.